Being the gateway to the Caribbean and Latin America, Miami has a large Cuban presence, evident in the vibrant neighbourhood of Little Havana. Art lovers can meander around the art districts like Wynwood and the Coconut Grove, while others can lounge on the miles of sandy beaches. For families there are kid-friendly attractions like the Seaquarium and Metrozoo. The nightlife is sophisticated and varied. The city also gives easy access to Florida's popular Gold Coast resorts and attractions, as well as the natural wonder of the Florida Everglades. 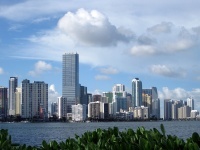 It is no wonder Miami is America's favourite holiday destination and the hub of a vibrant cruise ship industry, its port constantly jammed with sleek passenger liners. North of the city, the miles of beautiful beaches on the Gold Coast are hemmed in by southeast Florida's major tourist towns: Fort Lauderdale, Hollywood, Pompano Beach, and Palm Beach.